Funeral services for Glenn Jones, age 91, of Centerville, will be held 2 P.M., Sunday, April 7, 2019 at Walters Funeral Home in Centerville, Texas. Interment will follow in the Centerville Cemetery. The Jones family will receive friends Saturday, April 6th from 6 P.M. to 8 P.M. at the funeral home. Edward “Glenn” Jones was born March 23, 1928 in Center, Texas to parents, William Henry & Effie Estelle (Smith) Jones—the last surviving child of eight children. Following graduation from high school, Glenn took a few business classes and then began his career at Crane Plumbing as a bookkeeper. Glenn later went to work for Shell Refinery in 1950. 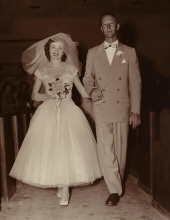 He married his sweetheart, Mary Ann Donahoe, July 18, 1953. During a year-long strike at Shell Refinery, Glenn found he could support his family selling used cars. He did this from 1965 to 1980 and was also able to save a little bit of his earnings. In 1980, Glenn and his family moved to Centerville from Deer Park where he went into the real estate business with Bonner Murff and Bill Wilson. He and his wife soon became faithful members of the Church of Christ in Centerville. Glenn always enjoyed going out to the farm in the evening with his wife and getting the opportunity to see the deer and watch his cows. He also loved his numerous hunting trips to west Texas and other states, such as, Colorado, New Mexico and Wyoming. Glenn passed away April 3, 2019 in Bryan following a brief illness. He was preceded in death by both of his parents; son, Stephen Glenn Jones; five brothers and two sisters. Glenn’s surviving family members include wife of sixty-five years, Mary Ann Jones of Centerville; sons, Michael Jones of the Philippines and Brian David Jones of Centerville; daughter, Cheryl Ann Brown (Craig) of Houston and grandchildren, Joseph Brown, Aaron Brown, Mackenzie Ann Jones, Makaila Lane Jones and Mark Jones. To send flowers or a remembrance gift to the family of Edward "Glenn" Jones, please visit our Tribute Store. "Email Address" would like to share the life celebration of Edward "Glenn" Jones. Click on the "link" to go to share a favorite memory or leave a condolence message for the family.